Although GPO’s 150th anniversary has been on my mind lately, March is also Women’s History Month. A couple of years ago, Answering the Call: The U.S. Army Nurse Corps, 1917-1919, an excellent photographic history published by the Office of the Surgeon General’s Office of Medical History was one of the American Library Association’s Notable Government Documents. Established in 1901, the Corps had sent nurses to Vera Cruz, Mexico during General Pershing’s Punitive Expedition, but World War I saw Corps nurses mobilized on a much larger scale. At first, Army nurses served in six British general hospital units while American troops were trained and mobilized for service in France. As American troops arrived, some nurses assigned to special teams wound up in the front lines, dealing with shock, surgical, gas, and orthopedic cases. Answering the Call is profusely illustrated by Signal Corps photographs of the grim reality of modern warfare, including truckloads of wounded soldiers and grim-faced stretcher bearers carrying casualties to the closest dressing stations. Nurses also served in field hospitals and mobile units that ferried the injured back from the front lines. Owing to accidents and the great influenza epidemic of 1918, some Army nurses died while serving their country, as depicted in moving photos of military funerals and grave sites. It wasn’t all, grim, though. Answering the Call also shows nurses relaxing as best they could, participating in patriotic plays, and enjoying whatever opportunities for distraction they could find. I’m not a historian of photography, but it does seem that this decade marks a departure from the predominance of unsmiling group photos – smiles make those photographed appear more contemporary and individual, despite the period uniforms and poses. This book opens a window to an organization and a period seldom mentioned in histories of American involvement in World War I. Both the images and text work to conjure up yet another aspect of women’s history that should be better known. 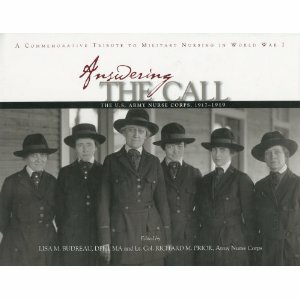 Answering the Call is available here or in a library. Quite a few Notable Government Documents came our way in 2008. I’ve blogged about a few of them, but looking over the list reminded me that there are some really good ones I haven’t gotten to yet – so stay tuned!